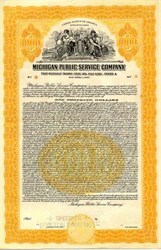 Beautifully engraved Specimen $1000 Gold Bond Certificate from the Michigan Public Service Company dated 1927. 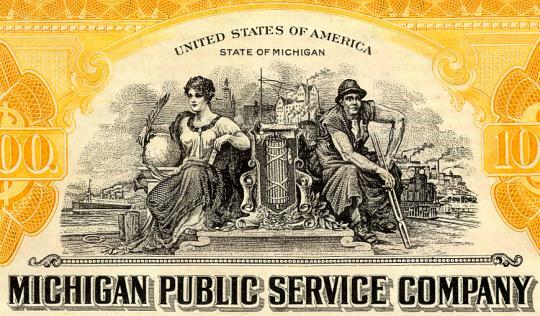 This historic document was printed by Hamilton Bank Note Company and has an ornate border around it with a vignette of a man and woman with a train, ship and city in the background. This item is over 79 years old. Incorporated under Michigan laws in May. 1927, as successor to company of same name. Acquired by consolidating the physical properties formerly owned by Boyne City Electric Co., Boyne River Power Co., White River Power and Light Co., Michigan United Light & Power Co., Michigan Public Service Co., Grayling Electric Co. and Elk Electric Co. In 1928, acquired properties of Northern Michigan Public Service Co. and in 1929 entire capital stock of East Jordan Electric Light & Power Co. On June 30, 1939, company acquired the hydro-electric generating plant and other property of Inland Power & Light Corp. (former parent company) in and about Cheboygan, Mich., together with entire capital stock of Cheboygan Slackwater Navigation Co. In Oct., 1930, control of company was acquired from Inland Power & Light Corp. through purchase of all common stock by a syndicate headed by Otis & Co., Cleveland. Stock was subsequently offered to the public. BUSINESS Furnishes without competition electric light and power to 100 communities in western Michigan (territory extends from Muskegon County near Whitehall northward on the east shore of Lake Michigan through Ludington and Traverse City to Mackinaw City and Cheboygan) with a combined estimated population of 62,000. The principal industries of the territory served are agriculture, fruit growing, manufacturing on a small scale, and summer vacation and tourist business. PROPERTY Electric system includes 13 hydro-electric plants, 1 steam electric plant and 2 Diesel driven plants having a total installed capacity of 14,472 k.w. and 840 miles of high tension transmission lines. Water service supplied at Gaylord; 3.5 miles of main, 497 customers; daily pumping capacity, 600,000 gallons. Electric Rates: Urban electric service ratesfor residential and commercial service ar, divided into three main groups as follows: Group I-Rates for cities or towns havini 500 or more electric meters. Group II-Rates for towns having 1 to 4% electric meters. Bonds were Payable in Gold or Gold Coin to give the impression that they were a more secure investment. In reality, they were not more secure since there wasn't any gold set aside as collateral for these bonds.